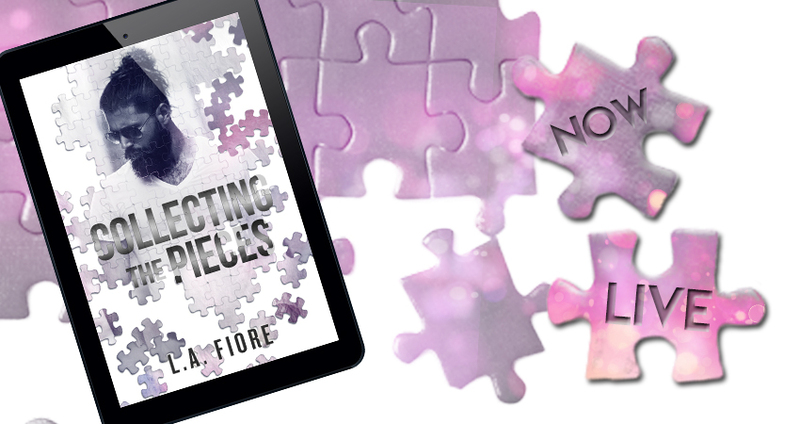 Collecting the Pieces by LA Fiore is LIVE!!!! I seem to be in the minority with this one, after all the five star reviews I have seen I thought I must be broken. I am an emotional reader, I thrive on all those intense feelings and love a good cry but I have to say, this one didn’t make me shed a tear, even though it should have. Maybe I was in the wrong head space, I don’t know, but I have to review honestly and for me, that deep character connection was lacking, however, I loved the story. Sidney was born to parents who didn’t want her, so much so she was left on the hospital steps as a new born, she then spent ten years in a kids home before finally being fostered. The foster parents were in it for the pay check and there was not a parental bone in any of their bodies. Luckily for Sidney though, they had another foster child, a boy, Sidney finally had a family, she got a brother. Sidney has many issues, mainly of abandonment and feeling unloved, her brother, Connor made headway but he began to lose his way too and the rub off onto Sidney was not good. Sidney meets Jake, the most popular kid, the quarterback and love blooms…but even flowers die. Making a new start across town, now a qualified vet, Sidney and her best friend begin a new adventure, their own practice. They are in ranching and farming country, with ranches being passed down generation to generation and where everybody knows everybody. This was a tight knit community and soon Sidney is well and truly taken into their bosom. New life, new job all Sidney needs is a new man…but is she ready? Abel runs his own motorcycle rebuilding garage; he looks like the bad boy but he has a heart the size of Texas. Never having his head turned by anyone he cannot believe the reaction he has whenever he is in Sidney’s company, or even in her breathing space. He knows that she is not a one night stand kind of woman, he knows that she is a forever kind, a two-point-four kids and marriage kind of woman…but is he ready? LA Fiore delivers a cute romance laced with an undercurrent of crime and suspense. It seems small towns have their fair share of unsavouries too. I did enjoy this sub plot and I had no idea who the killer was until it was revealed. Sidney and Abel’s love story was cute and swoon worthy and testament to a real-life fairy tale. I would have loved to have felt it with every fibre of my being but as I said above, I just didn’t get that character connection. For me a little more depth and less of a rush would have made this a top five star read.